As a midwife, birthing partner and mother with more than a decade of child-birthing experience, I am often asked to comment on my work and share advice. Feel free to browse these samples below and learn more about my takes on birthing, postpartum care,and the state of midwifery and delivery around the world. CPM midwives are awesome! Both of my little ones were born at home and I learned, first-hand, how amazing they are. As a doula, I look up to them. They are protectors of space. Good midwives sit on their hands. They, also, have magical fingers and deeply-rooted knowledge. Their knowledge can help birthing mothers remarkably. NEW: I gave some practical advice to grandmothers in this lovely video by Tanya Upshur. I was a guest on the Midwives of Color Blog Talk Radio show. Listen to my interview, "In the Light of Birth" and visit their website to read more. Birth work is based on heart to heart; The client absolutely needs to find practitioners whose heart sings to her heart. But we have to let our clients know of all of their opportunities and then hope that they still come back to work with us. I believe it’s our job [as birth workers] to take this on so that we can work to enable every group, culture, and society to have the best birth they can while we fight for universal change. I was invited on "The Whole Mother Show" to speak about my initiative to reduce disparities in birth outcomes - "The Grand Challenge", as well as my other work within the birthing community. On "Claudia Speaks," I share my experiences of being a single mother and a doula. I was a guest on the "Hail to the V" Podcast. A Maternity Care Desert Threatens Lower Income Women in Washington, D.C. 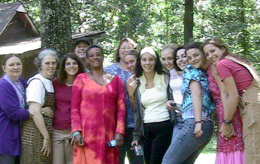 I studied with Ina May Gaskin and the midwives at The Farm in Tennessee. Get insight into this institution and my studies there through The Farm blog. In 2012, I completed an intensive apprenticeship at a high volume birth center in Senegal, West Africa. You can read about my journey on the Senegal blog.